Dogwood (Cornus Nuttallii)—Only a few of the most common and attractive shrubs will here be mentioned. One of these is the dogwood. In the month of May, with its large, white, showy flowers three inches in diameter, it is a pleasing sight never to be forgotten. Later on, in October, its brilliant colored leaves are even more attractive than its flowers. Azalea (Azalea occidentalis)—This beautiful flowering shrub is very abundant along the banks of the Merced River and other streams and slough borders in Yosemite. it begins to open its white, fragrant blooms early in June, closely following the dogwood’s decaying flowers. In some cold, shady places it may be found in bloom until late in July. The flowers are generally white, with a yellow blotch on one of the lobes. In some rare instances the flowers have a very pretty pink tinge. of a red color and has the taste or flavor of dried apples. The Indians make great use of it as an edible berry, and also make an excellent sweetish cider by crushing the berries and leaching water through the mass in one of their strainer baskets. California Lilac (Ceanothus integerrimus)—This variety of the California Lilac is quite numerous along the rocky borders of Yosemite Valley. Its branches are of a green color. Its flowers are white, in dense oblong clusters, from two to three inches in length. They are very fragrant, with the strong odor of wintergreen. The young growth of the branches also has the strong flavor of wintergreen or black birch. There is another variety of the Ceanothus growing in the sandy part of the Valley, near the cemetery, with pale blue flowers. Spice Bush or Sweet-Scented Shrub (Calycanthus occidentalis)—This is another one of the beautiful shrubs in Yosemite. It grows in rather wet, rocky places. The flowers are of a dark red or wine color, having a spicy, fragrant odor. This shrub is not found very plentifully around the Valley floor, the altitude being a little above its favorite habitat. Wild Syringa (Philadelphus)—This, with its dense masses of pure white flowers, forms another of the attractive flowering shrubs in Yosemite. It resembles very much the cultivated syringa. Wild Rose (Rosa blanda)—This variety is quite plentiful in Yosemite. The bushes are three or four feet high, well armed with sharp, curved thorns. Its flowers are of a pink color, and very fragrant. Elder (Sambucus glauca)—This variety is very common in Yosemite. The stems are from six to eight feet high. Its flowers are white, in large flat-top clusters. Its fruit is a small, dark-colored berry covered with a light-colored bloom. These berries are tart in flavor and make fine jellies. They are a great favorite with the Indians. Choke Cherries (Prunus demissa)—This is a very common shrub in the Valley. It grows from six to ten feet high. 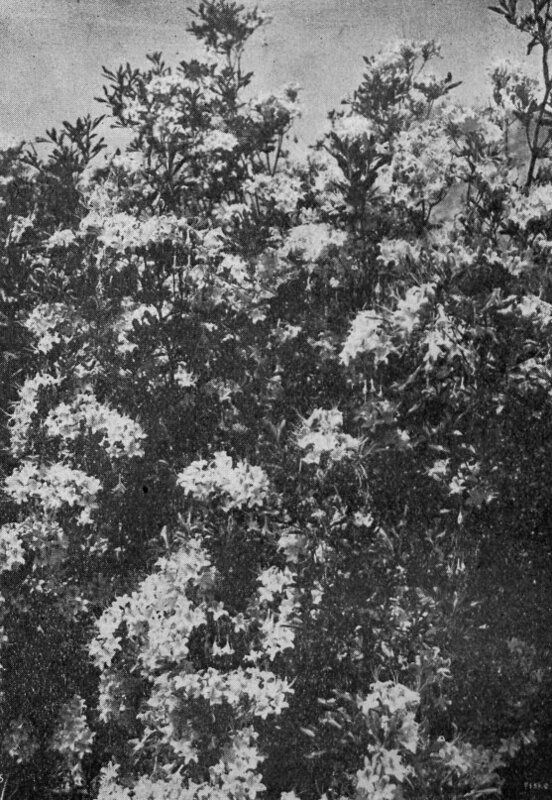 The flowers are white, in dense clusters two to three inches long, emitting a strong and not unpleasant odor. The fruit is dark. red in color, and very astringent until dead ripe. The Indians, gather all they can get of them. Thimble Berry (Rubus Nutkanus)—This is a variety of the raspberry. It is generally a low shrub, about three feet high, with large broad leaves. Its flowers are white, an inch in diameter. Its, fruit is red and juicy, with a slightly acid, pleasant taste. Willow—Willows are very numerous in Yosemite, along the banks of the Merced River and smaller streams, and in the marshy meadows. Their beautiful white silky catkins, as they emerge from their winter wrappings, are always a joyful sight as the heralds of the coming spring, proclaiming the resurrection to renewed life of all Nature’s most charming features. Wild Coffee (Rhamnus Californica)—This is a very common shrub in Yosemite. It is from six to eight feet high. It gets its name of Wild Coffee from the fact that the two seeds in the berry very much resemble the coffee bean, but that is as far as any resemblance goes. Upon careful analysis it is found to have none of the qualities of coffee. Its flowers are very small and inconspicuous, but the bark contains valuable medicinal qualities. For this reason it was called by the Mission Fathers Cascara Sagrada—the sacred bark. An extract from the bark is the most valuable laxative known. Yerba Santa (Eriodictyon Californicum)—This shrub is about three feet high. Its flowers are purple. Its leaves are thick and glutinous, of a bitter aromatic taste are highly prized by the native Indians as a remedy for rheumatism, colds and fever. Service Berry (Amelanchier alnifolia)—This in Yosemite is a slender shrub three to six feet high. Its flowers are white. Its fruit is a berry nearly black, sweet and juicy, and highly prized by the Indians.